Ultraviolet light has been suggested by many as an alternative solution to stopping microbial growth in HVAC systems. But is it all that it’s made out to be? How well it disinfects depends on many things. 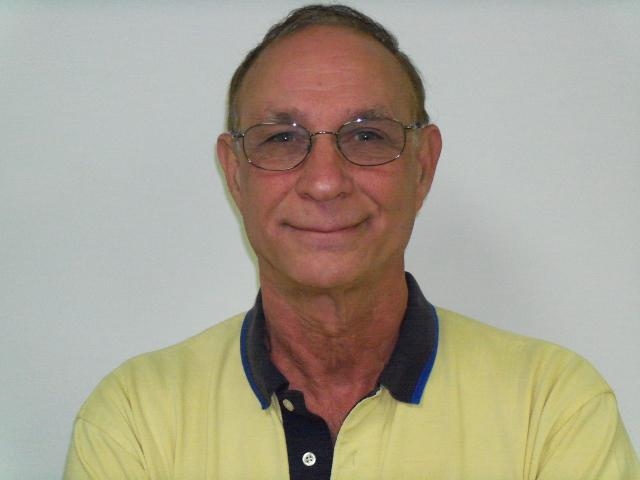 Review the principles of UV light and decide for yourself. Light travels in straight lines, unless of course it is going around a massive object like the Earth, in which case it will bend slightly. Because light travels in straight lines, the effectiveness of a UV light source is limited. When placed in an air handler, a UV lamp can not penetrate into the cooling coils. As seen in the sketch, light can only reach small portions of the coil. 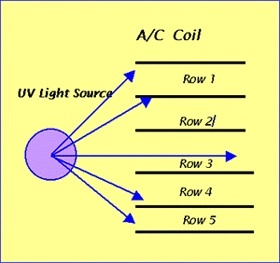 Coil sections that are at an angle to the light will not receive UV light, and thus no germicidal action can occur in these areas. Very little of the coil can be exposed to the UV light unless many lamps are used. Generally, this is not cost effective. Another issue is insulation. Insulation in most air handlers is made of fiberglass. Microbes can, and do, proliferate under the surface of the fiberglass, where UV light cannot reach. Again, if the UV light has no exposure on the microbes, germicidal efficacy is non-existent, and microbes will continue to grow. When micro-organisms do get exposed to UV light, there is a certain amount of energy required for disinfection. Therefore UV bulbs must emit enough energy to provide disinfection. Additionally, contact time is important. Contact time refers to concentration of the killing agent vs. exposure time of the microbe to the agent. Kill rates for microbes can range from 3,000 microwatt seconds per sq. centimeter all the way up to 10,000 and higher depending upon the microbe. What this means is that UV bulbs must put out enough energy to kill the microbes. However, these bulbs deteriorate over time, producing less microwatt seconds per sq. centimeter. Additionally, the further the bulb is from the microbes, the less powerful the light. Even worse, dirt, moisture, and other substances that happen upon the bulb decrease the effective light output concentration. Over a few months without cleaning, UV bulbs may not provide the killing power they should, even in the limited area of exposure. Also, consider how much contact time a UV light has with a microbe traveling through an air handler at 400 to 500 cfm. Not much. So how effective is UV light on particles in the air stream? Not much. UV light has been proven to kill certain microbes. Its effectiveness, however, depends on numerous issues. Let us know what you think, and or about your experiences. We would love to know about them. Leave your comments in the section below.